IT was my first time to see Margie after she was felled by a cerebral aneurysm in Nov. 2008. 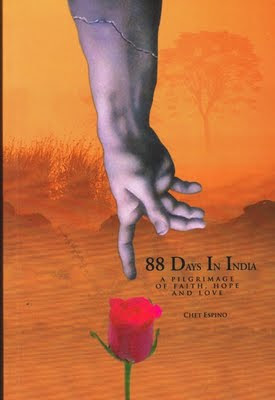 I spoke with her at the launching of her husband Chet's book, 88 Days in India – A Pilgrimage of Faith, Hope & Love, at the Powerbooks last night and it was just so inspiring to see how far she's come in her recovery. Although still in her wheelchair, she surprised us by walking up the steps to the second floor of Powerbooks, where the launch was to be held, albeit with the help of Chet. She asks for more prayers from all of us so she can really get back to walking unaided again. If you are still thinking of what to give your friends and family, I think Chet's book will make a great gift. Through his daily updates via email, all of us were kept abreast of Margie's condition, of the suffering she went through, of Chet's devotion to her, and her triumph over the direst medical conditions. Readers will be moved by Chet's descriptions of Margie's battles, and of the ways he coped throughout the ordeal. But as they say, love conquers all, and his unwavering support for his wife while she lay ill, became Margie's passport to her recovery.